I like CPC. I like its colourful graphics, great BASIC, active demoscene, I like it despite of the strange hardware design. So I feel a little bad that I haven't as much time as I want for it. Therefore when I was deciding what to do with my holidays, it was an easy decision. ReSeT party was a great choice for two reasons. At first I could see how the CPC scene looks like and at second I could visit France for the first time. So one month before the party I bought train tickets and was looking forward for the date of the party. Original plan was to go to Nantes on Thursday, spend night at Pulkomandy's home and move to Rennes on Friday and go to Coutances by car with CloudStrife and Sylvestre. Everything changed when I arrived to Berlin Hauptbahnhof and discovered that they shifted my train 45 minutes sooner because of the floods in Germany. So, full of stress I visited ticket office and they kindly rebooked my tickets to later trains. Then I just waited for my train and moved forward France. In Frankfurt I changed german ICE with france TGV and enjoyed high speed track. Well, not really. The floods damaged the tracks, so we went on another track and got +1 hour delay. My first contact with France and french railways was an offer of hotel and prolongation of my ticket to next day. Viva la France! For me, little guy from "ostblok", it was like a miracle. Next day I took TGV to Nantes and I met there with Pulkomandy. After a breakfast we took a train to Rennes and there waited for a car to the party. Because we had a lot of time we got typical Britany lunch - pancakes and as all other food in France, they were great. The car was two hours late, but we couldn't move from the train station, because of the heavy luggages. So, after a long waiting the car was there and we moved to pick up Sylvestre. Because of the works on the roads in the town center, we had nice sightseeing during our move through the town and arrived to Sylvestre's home. Our car got a bit overload, but after a bit of baggage tetris we moved forward Coutances. The party was held in Foyer des Jeunes Travailleurs, which is a nice community center with kitchen, conference rooms, sleeping rooms and other things. The party itself was in one smaller room, just big enough for the meeting. After the arrival I occupied place with unused TV. Because I don't use my CPC with original Amstrad monitor I was OK with this solution. Next to the entrance were tables with food and drinks. This was one of the things why you have no reason to leave the place and can spend all the time with CPC. Plus you had deliciously cooked food three times a day. Remember, you are in France, all the food is great! Soon after I setup my CPC and run some random demos, I tried to do some "real" code on CPC. So, after a short "discotheque" with DAMS, code, freeze, reset and back to the start, Pulkomandy noticed that I have also my Ramcard that he gave me on Forever, but I can't use it, because I haven't any cable to connect it with my computer. So, after a while he came back with cable (I think it's from Eliot's CPC Parts stock) and setup the Ramcard with some useful utilities. One of the utility was also DAMS, what a comfortable coding! Thanks! Pulkomandy also brought batch of his new RamCard boards. 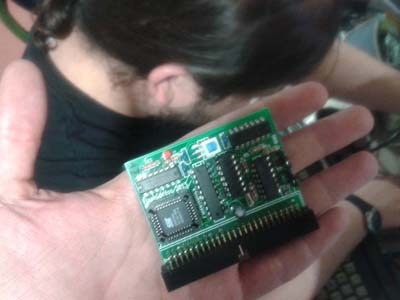 He worked also on a new CF card interface for CPC and had prototypes of interfaces with SD slot too. On second day there was a presentation from TotO about his new interface which can act as a ROM module, can play Spectrum musics directly on Amstrad sound chip without any conversions and some other things. Presentation was quite long, with big discussion and all in french, so I can't tell you much of details. 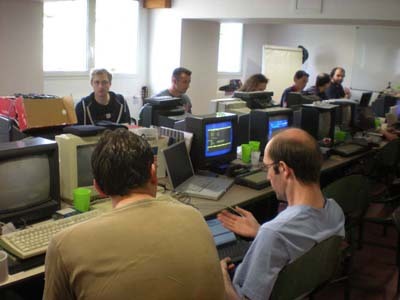 I continued with my coding and got help from Eliot, who explained me overview of the rasters on CPC and after few non-functional versions I got an issue of Quasar fanzine from OffseT with exact description of the effect I wanted to code. In late night I got help from Krusty and Sylvestre who made a palette for the effect. 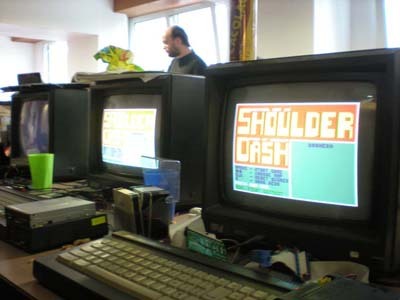 A lot of people connected their computers with network similar to Virtual Net 96 and played games (I noticed Boulder Dash and Tron clone). The circuit is quite simple, it's connecting into paralel port and works similar as ZX Network. Next time I must build my own interface too, because it looks like a big fun. I must also mention an Atari ST, which was running some demos in back of the room, but not many people were watching them. More interesting was Oric computer with presentation from its owner. There was much more to see, water effect for CPC+ that looks like from Amiga for example, but because I was the only one non-french speaking, I didn't understand or I simply forgot. Anyway, the party was great and if it will happen again I'll come.